Arts & Disability Ireland and Fishamble: The New Play Company commissioned four artists with disabilities to write new short theatre pieces for a writing initiative entitled Turning Point. Staged readings were performed in Project Arts Centre in Dublin and at the Lansburgh Theatre in Washington D.C. as part of the VSA International Festival. Turning Point was initially presented at the Project Arts Centre’s Space Upstairs in March, 2010 directed by Jim Culleton. The reading was performed by Cathy Belton, Michael Collins, John Cronin, Phelim Drew, Darragh Kelly, Mary Murray, Colin O’ Donoghue and Donal Toolan. Arts & Disability Ireland and Fishamble: The New Play Company were invited to contribute the selection of plays as a staged reading in June, 2010 at the Lansburgh Theatre in Washington D.C. as part of the VSA International Festival, which brings together artists, educators, researchers, and policymakers with and without disabilities from around the world for a multicultural celebration of the arts and education. 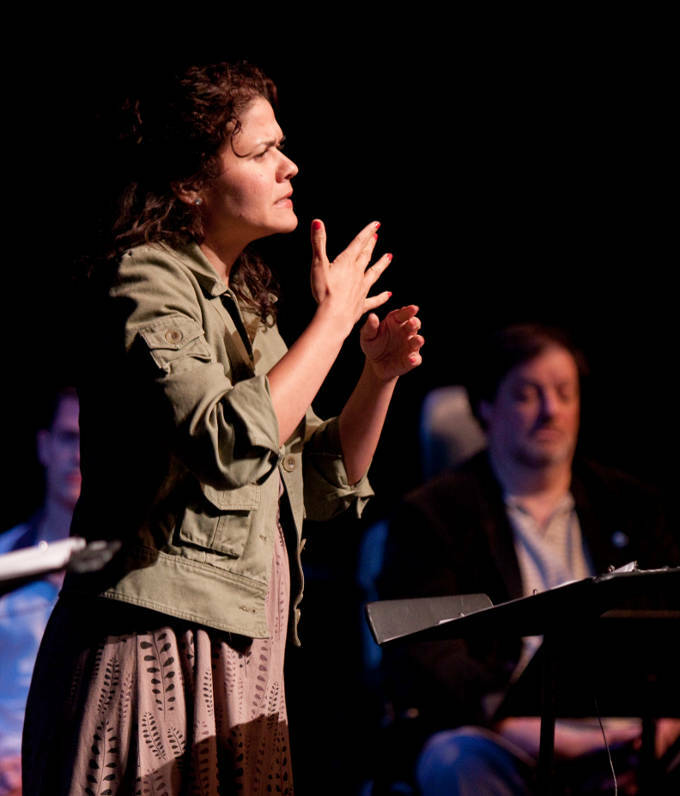 Jason Lott and Alexandria Wailes during a staged reading of Rings by Rosaleen McDonagh at the Lansburgh Theatre in Washington D.C. as part of the VSA International Festival. Photo: Bathsheba Fournier. But is being defined as a disabled artist such a bad thing? 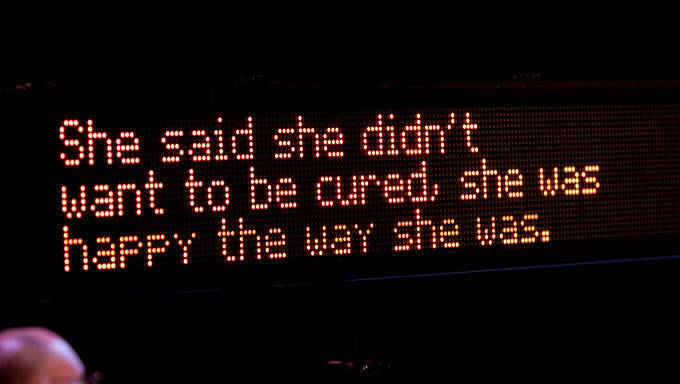 Disabled experience is ripe for artistic exploration. 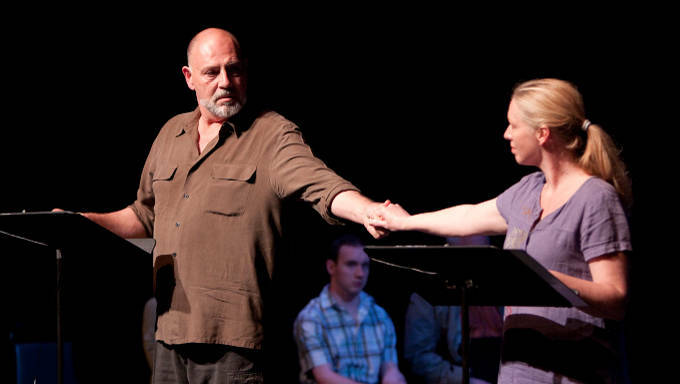 Captions on display at staged reading of Turning Point at the Lansburgh Theatre in Washington D.C. as part of the VSA International Festival. Photo: Bathsheba Fournier. Brian Hemmingsen and Nanna Ingvarsson during staged reading of ‘Ellipsis’ by John Austin Connolly at the Lansburgh Theatre in Washington D.C. Photo: Bathsheba Fournier. 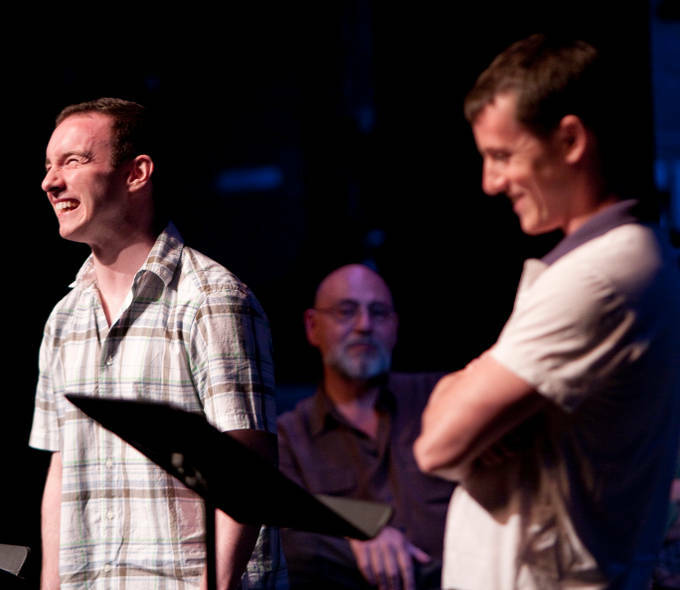 Jason Lott and Christopher Wolfe during a staged reading of Should Have Gone To Lourdes by Stephen Kennedy at the Lansburgh Theatre in Washington D.C. Photo:Bathsheba Fournier. Turning Point writers Steve Daunt, Rosaleen McDonagh, Stephen Kennedy and John Austin Connolly during a post reading discussion with Gavin Kostick. Photo:Bathsheba Fournier.